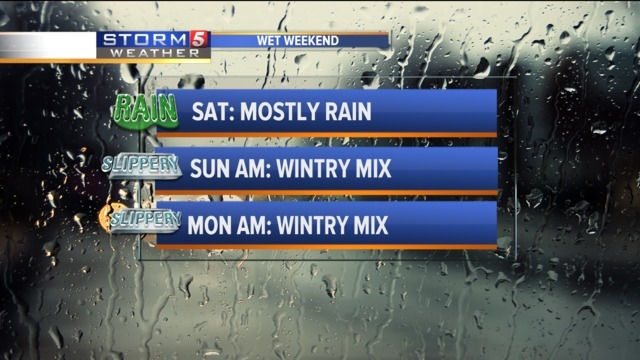 A mix of rain, sleet and snow is expected over the weekend, specifically Sunday night into Monday. It's expected to begin Saturday morning with a band of rain that works in from the Southwest. It could include a few sleet pellets or wet snowflakes mixed in Saturday morning, but it will quickly transition to all rain. Widespread, a total of half an inch to an inch of rain is expected to fall on Saturday. Overnight Saturday into Sunday morning cold air will transition some of the rain to a sleet/snow mix, mainly along and North of I-40 before tapering off by the afternoon. A final shot of a wintry mix of snow, sleet, and some cold rain will sweep across the area Monday morning. Since rain is will mix in, accumulations will remain minimal. The rain will cause ice to melt or will wash away most of the snow/sleet that falls. But if you're out and about during the wintry mix roads will be slippery, especially during those morning commute times. Stay weather-aware with the Storm-Shield app and check the radar before going out.